The Dark Book: Lazy Sunday. Off late, I had inculcated a habit of reaching office early, around 8:30 AM. And for that I was regularly getting up at 6:00 AM. This sure did take a toll on me. Hardly past 10:30 PM, could I manage to keep my eyes open. So this Sunday, I decided to take a good long sleep (I call it a shutdown, in windows terms !) before I could start with my weekend activities. Buy a rain cover for my car. Clean the cupboards in kitchen. Buy some groceries for the coming week. I had to get the third one done before my maid came, since there was nothing at home to cook. I thought this was a great pretext to shrug off some work. I decided to not do anything till 12 noon. And then to go out for lunch. On my way back from there, I could also buy the groceries, and the rain cover. So I could wind up all things in one drive, and also spend the hot humid afternoon time in air conditioned restaurant / car / shopping mall. The trick sure did work for me. We had a nice time lunching out, and driving around the town. The weather was not as bad as I expected. So we also decided to drive till Greater Noida. Also I conveniently forgot about the kitchen cupboards, and the rain cover. After all, there's always the next week!! Though, as I have to be a bit responsible, I managed some time between my two trips to Greater Noida, to stock the groceries for the coming week. Throughout the day, we went on an eating binge. And as such I found it appropriate to write about it, since we actually found some really good food on the offering. I recommend a visit to these places while you are in Noida. It is a great way to spend time, and an affordable one at that. This is a new restaurant from "Bamboo Shoots" in Sector 18. It has a variety of Chinese offerings, and to top it they also have a "Terrace Grill" section which serves awesome Multani / Punjabi dishes. I had been here a couple of time before, but I had always ordered Chinese starters. For a change we peeped in their Indian menu, and ordered good ol' "Hara Bhara Kabab". 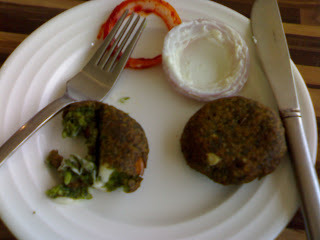 To my surprise, it was not like any other "Hara Bhara Kabab" I had eaten anywhere else in India. It was all packed with Peas and Spinach paste, and stuffed with Cheese. To make things interesting, it is served with onion slices smeared in two mystery sauces, one red and the other white. And the combination simply tastes out of this world. One ought to try this when at Lemon Twist. 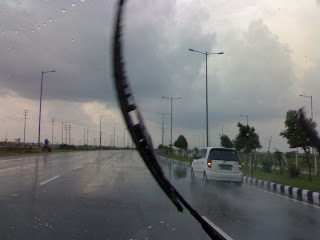 After the lunch we hit the road, and took a "mast" long drive till Greater Noida and back, The weather had become superb, and it also started to rain. It simply added to the fun. The stretch is really very very wide, and you can keep the fifth gear, and cruise on speeds above 90-100 KMPH without any worries of traffic and congestion. The long drive was simply not enough for us, and we also had ample time left, before the darkness set in. So we picked up two of our friends. They had been nagging us for quite some time, about us not taking them on a drive anywhere. So we had some tea, relaxed a while, and hit the road again. On our way back from Greater Noida, we moved onto the road which leads to Sector 15, and took a U turn to come back to Golf course. A number of "Challi" vendors have put up stalls there. "Challi" is corn, not traditionally roasted, but left to boil in a heap of hot sand, and served with spicy Punjabi curry smeared all over it, with a generous dash of lemon. My wife simply loves this, and our friends liked it too. It was already 7:30 PM by this time, so we decided to head for dinner. Sector 18, and TGIP are really crowded, and the rush is maddening for me. So we again headed for Sec 63. This place is yet un-noticed, and yet houses 3-4 top of the class restaurants. One of them we had already rounded up in the morning, and it was time to try the next! This place has a class to it. The moment you enter it, the delicious smell of asian vegetables and spices fills your nostrils, igniting your tase buds. And like Lemon Kitchen, they too have an Indian menu. It was a treat on our friends, as one of them is flying to UK soon, and the other had her birthday some time back. We ordered a soup in both veg and chicken versions, which is called, Lemony Pepper soup. It is available in either "Serves 1" and "Serves 2" potions. But when we ordered the "Serves 2", we found that it can easily serve 3 - 4 people. Asia Kitchen has a unique way of serving the soup. They do not bring it to you in bowls. The bowls are kept for each person on the table. And the soup is brought to the table in a larger bowl with a unique looking serving spoon. So you can easily order a "Serves 2" potion and and split it yourselves among an many people as you like. For starters we ordered, Golden baby corn, and Pan fried Fish. 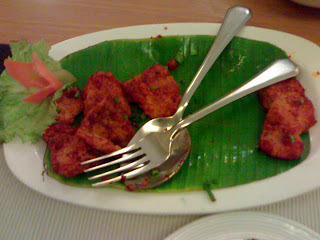 The Fish simply tasted ummmmmmm, slurrrrrpppp, yummmmm with the special Chilly Honey sweet sauce from the house. I recommend the Lemony Pepper soup and the different fish on the menu to anyone who visits this place. This is another popular joint on the lines of Haldiram's (in Spice Mall), next to Lemon Twist, and a five minute walk from Asia Kitchen. It serves "Chat", "Namkeen", "Mawa Mithai", "Bengali Mithai", South Indian, Chinese, ice creams and what not. It is just 10 minutes drive from CSC's Noida Towers building. And I love to have a quick bite of "Aloo Tikia" after office. The "Aloo Tikia" is simply awesome. After both our meals today, we visited Bikanerwala, to indulge ourselves in a range of "Bengali Mithai" like Rasogulla, Rasbhari, Raskadam, Rasmadhuri and Rasmalai. By the time we were done, we were dripping sugar from our mouths. LOLS. Phew, it was a long day, and so a long post. But the best day I ever had in terms of eating good food while I am staying in Noida. They are yet un-noticed. The rush is almost zero on Sunday nights. There is huge and free parking space. And it is not risky as well, since it is right in front of the restaurants. The staff is very polite, especially at Bikanerwala, which comes as a pleasant surprise as compared to Haldiram's. Although, I would suggest to go there in a four wheeler, if visiting in the late hours, because the area is not yet fully developed. There are stretches on the road, when you will see no one. So better be safe than sorry. In day time, this is buzzing with activity, with people coming from all nearby offices to have a good meal. I hope you enjoyed reading my post. If you ever do visit these places, and try something which you like, do let me know!! Found another blog on Lemon Twist. 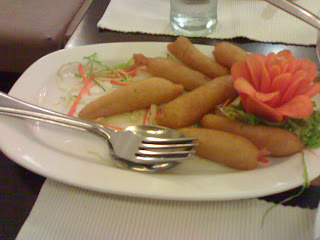 Here is the link "http://enjoydelhi.blogspot.com/2008/04/lemon-twist-noida.html"